After washing my hands for the seemingly hundredth time that day, I yanked my hand back in response to the sting of the water on my finger. Angrily, I realized I had a paper cut. Where in the world had it come from? Now my life is full (and I'm sure so many of you can relate), and often the mundane details are difficult to recall, but shouldn't I have remembered hurting myself? Most of the paper cuts I've received were very obvious and painful when they happened, so how did this one sneak past? Tricky little thing. The little things can hurt the worst. Tiny though it was, the pain and discomfort I felt from that paper cut had a much larger impact. Everything I did that day was marked by its presence. Writing/typing, making snacks, driving, adjusting my glasses - it was there, irritating my very existence. Something so insignificant had now disrupted my routine. It didn't take long for my attitude to catch up. I'm pretty sure Paul wasn't talking about a paper cut when he described the thorn in his flesh, but when you consider its size compared that of the host, it shouldn't be that big of a deal right? Hmph. He called it a messenger of Satan, and ya'll that sounds like a thing to me. A real thing that he pleaded multiple times for God to remove. God's response? "My grace is sufficient. My power is perfected in weakness." Okay God. I hear you. 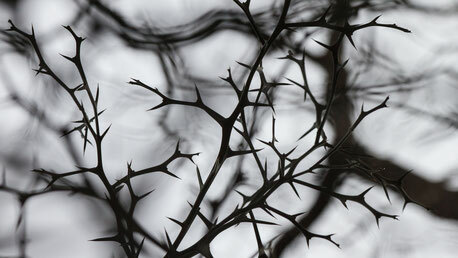 Paul had the wherewithal to accept God's answer and trust that the nagging thorn that had disrupted his routine would be covered by His grace. Paul's issue was probably not a literal thorn either, but whatever it was, it was a constant reminder of his need for God's grace. Ya'll having that paper cut became a thing, and I allowed it to color the tenor of my day. Being diligent and intentional with my tasks helps to limit my exposure to them. Alas, they still happen. What small things have crept into your routine without you realizing it? What unnoticeable distraction has wormed in and caught you unaware until pain alerted you? Anger? Disappointment? Self-defeat? Comparison? These are just a few of the "little foxes" that threaten to ruin the vineyards of your sanity and peace of mind. What are little foxes? Take a quick trip with me to Song of Solomon chapter 2 verse 15. The Shulammite woman engaged to her beloved sent out a call for someone to catch or round up the little foxes that could spoil the vines (love the imagery in this book). She knew that little things left unchecked could damage the love between her and her betrothed. Smart woman. Friend, whether you are dealing with thorns from God or little foxes that sneak in, know that you aren't alone in the struggle. What I love most about God's response to Paul is that He says His power is perfected in weakness. Good news! The weaker we are, the greater the opportunity for God's strength to be made perfect in us. Be encouraged, His grace is always sufficient.